Muffins deserve their own pair of pants! I bet you never thought about that happening, did ya? I’m currently running an online bootcamp entitled “Eff You Mom Jeans and Muffin Tops” because the ab region is the area most of my challengers shared they needed some work. Not only are we focused on our nutrition, meal planning, and our daily workouts, but we are working hard on getting rid of those muffin tops and avoiding mom jeans for-ev-errrrrrrr (Sandlot voice). I wanted to share one of my favorite healthy muffin recipes with my challengers and wanted to make it fun, so I decided the muffins needed some pants. Yes, they exist….you can actually buy them HERE! ***I also add in cinnamon to taste, usually about a Tablespoon. This is not part of Autumn’s recipe, just something I think makes them even tastier! Preheat your oven to 350 and prepare muffin tin by spraying with nonstick spray or paper liners. Combine eggs, banana, and butter in a bowl and mix until blended. Combine baking soda, almond flour, and salt in a separate bowl, then mix in with banana mixture. Fold in apples and cinnamon (if you are using). Divide batter between muffin cups (this recipe usually makes about 9 muffins). Bake 16-18 minutes or until golden brown. That’s it! How easy are they? -I prefer using silicone baking cups, so I loved the little silicone muffin pants. However, they do make smaller muffins. In the batch I made last night I was able to make 9 regular muffins and 4 muffins wearing jeans. I also was worried about overfilling them so they didn’t end up with a true muffin top, which is actually okay since we are working on getting rid of them anyway! -You want to use ripe bananas…..as in REALLY RIPE bananas. If you follow me on Instagram (@sparklefitnessbabe) you probably caught my IG story where I showed how RIPE mine were….they were basically black! I love baking with bananas at this state because you can mash them so much easier and they are so much more flavorful! If you are a 21 Day Fixer, 80 Day Obsessioner, Hammer and Chiseler……these count as 1 purple and 1 blue (blue is the almond flour. If you use another flour you will want to adjust accordingly). I don’t normally do back to back recipes, but since it’s been awhile AND Halloween is just around the corner, I wanted to share a fun twist to one of my go to recipes: the stuffed pepper! A few years ago I shared my recipe (you can access it here), and it has remained a constant on my meal plan over and over again. Stuffed peppers are so much fun because you can change up how you make them based on your likes. Sometimes I use rice, other times I use quinoa. Sometimes I use black beans, sometimes I don’t. Sometimes I season with taco seasoning, other times I don’t. Be creative with them! I wanted to turn the pepper into a little jack-o-lantern to be festive, and it was surprisingly easier than I thought. All you need is a sharp paring knife (I use one from Pampered Chef that was the perfect size), and sub in orange peppers in place of the green peppers! If you are the kind of person who usually tosses the “hat” or top of the pepper, don’t this time. Make sure when you make the cut you do so relatively close to the top so there is plenty of room to fill with your stuffing AND so it resembles the top of a pumpkin. Remove the innards (I call it the pepper brain). Using your knife, “carve” your pepper pumpkin. Prepare your stuffing mixture, then fill your pepper pumpkin. Place pepper pumpkins in a 9×9 pan (or larger if you are making a larger batch). Place top on each pumpkin and bake for about 40 minutes at 300! Your family will love them, and you’ll be hooking them up with a healthy and festive dish! Enjoy! 21 Day Fix, Donuts are Life., Eat, Drink, Be Merry! I DONUT live a life without donuts! Donuts are one of my all time favorite things….I’m pretty sure anyone who reads my blog and follows me on Facebook knows this. I mean…..I captain a running team called Running for Donuts and run the race with a donut on my head. It’s an obsession. I’ve embraced it. Every now and again I like to enjoy a donut from Peace, Love, and Little Donuts….a franchise that makes the best donuts around, but most of the time I prefer making healthier versions of this treat. I know what you are thinking…they don’t taste like real donuts. If you are after the Fruity Pebbles donuts or Creamsticks, then you are right….you can’t make those kinds healthy regardless of how hard you try. I love chocolate, and I love chocolate glazed, so the recipe that I make the most is the closest thing to that. They are so good! Donuts that taste like a brownie but fit in any meal plan. Mix well. If batter is too thick, add more applesauce or water until it reaches desired consistency. Bake for 20 minutes at 350 degrees! Enjoy! **If you are a 21 Day Fixer, I break one donut down to be 1/2 cup yellow, 1/2 purple, 1/2 red. You won’t regret these beauties! 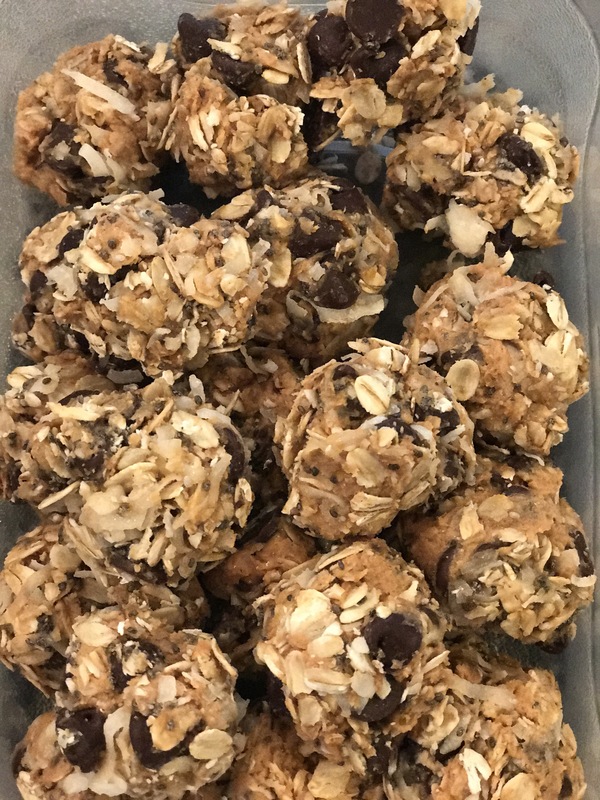 I’m a huge fan of energy bites….I have so many recipes I could share! I wanted to share the one I make the most…it’s so easy, quick, and delicious! Plus it’s versatile…so feel free to omit or add something to change it up! Combine everything in a bowl (using your hands is best) and place covered in fridge for about an hour. Then roll into bite sized balls and keep stored in fridge for up to a week. Guys, my love for tacos….it is a deep, deep love. They are right up there with pizza when it comes to my favorite foods. One thing I pride myself on is finding a way to balance the things I love with living a healthy life. This is so so so important! No lifestyle should have you completely eliminating everything you love; that is just setting you up for failure. Tacos are one of those foods that YOU have the power to make healthy. I brown ground beef all the time and use a taco seasoning (my favorite is the Southwestern mix from the 21 Day Fix plan) and serve on healthy taco salads, as tacos, or, in this case, as taco cups! 1. Use corn tortillas. These are actually gluten free and a tasty alternative. 2. Swap out sour cream and use Greek yogurt instead. 3. Utilize ingredients such as black beans and corn. 4. Opt for cheese that is grassfed…stay away from the bagged shredded cheese! Do you know that bagged cheese includes powdered wood pulp (on the bag it says CELLULOSE), which prevents it from clumping? Gross! If you can’t find grassfed, buy a block of cheese and grate it yourself. Wood pulp doesn’t fit into any meal plan….sorry to break the news. 5. Use lettuce as a taco shell or top with as much lettuce as you can! This week’s meal plan featured my incredibly easy and delicious taco cup recipe, and I had to share for my fellow taco lovers! This is a recipe that is great for kids and adults, can be easily transported, and can also serve as a great, healthy appetizer for events. Coat a muffin tin (or two depending on how many you are making) with coconut oil or nonstick cooking spray. Brown the meat and mix in the taco seasoning, just as if you were making regular tacos. Cut the tortillas into squares. (I take the excess and make homemade cinnamon chips with them to pair with fruit salsa….I can share that recipe later!) Place one square in each muffin cup, spooning some of the meat mixture into each cup. I use between 1-2 tablespoons in each. Top with a sprinkle of cheese. If you prefer, you can top with chess AFTER baking; it’s up to you! Bake at 375 for about 20 minutes…but keep an eye on them. Every oven is different! Watch your shells…no one likes a burnt taco! Top your taco cups with whatever you want….I use a small dollop of greek yogurt and another of guacamole! If you are following the fix meal plan, I usually count three cups as one serving, but it all depends how much meat you are using. Store in fridge and heat before serving! Enjoy! More like President of the Squash fan club! Over the last year I have become particularly found of the squash family….why I avoided it for so long beats me. I am consistently integrating spaghetti squash and acorn squash into my meal plan, but it was only recently that I gave their sister, butternut squash, a chance. I’ve been making this recipe for awhile and wanted to share with you all! It is great for Fall, for those of you doing the 21 Day Fix and needing to get your green containers in, or anyone looking for a great addition to your table at Thanksgiving in a few weeks. You know why I love it? I kind of feel like I’m eating a carb (sweet potato), but I’m not! Trickery at its finest! To prepare, you first want to skin the squash. I cut the top and bottom off with a sharp knife, then I use a vegetable peeler to remove the rest of the skin. Rumor has it that Costco has butternut squash already peeled and cut up if you want to skip this step. After you have skinned the squash, preheat your oven. You can do this before if you want; honestly it does not matter. I also prepare my baking sheet at this time. I’ve found that I prefer lining the sheet with a piece of parchment paper as opposed to spraying it with a cooking spray. Make sure you scoop out the seeds….no one likes seeds with their squash…at least not in this case. Cut into chunks. After cutting up your squash, drizzle with the EVOO, Maple Syrup, and Cinnamon. Bake for 40 minutes at 400 degrees. I rotated my baking sheet halfway through just to make sure everything was cooking evenly. Serve with whatever you want, and ENJOY! So tasty….and good for you! Nice Cream for the Win! I’ve been posting a lot lately about how much I love my Nice Cream, and it has had so many people asking about that I figured it was time for a quick blog! I LOVE ice cream, but I know that when it comes to my meal plan eating it every day is probably frowned upon, so I decided to find a healthier option to still enjoy one of my favorites without feeling like I was missing out. Best part about my Nice Cream (besides the fact that it is healthy, of course)….it is super easy to make. Here is a step by step walkthrough so you can make it, too…..I even have a video at the end showing you how I make it if you learn better by seeing! Toss 2 frozen bananas into your blender with a scoop of the protein powder you choose. Include a splash of the milk you have selected, but don’t get crazy with it…..you can always add a tad more if you need it a little creamier. Dump contents into a bowl once you have reached the desired consistency! The ice cream itself will be 2 purples and 1 red if you are following the 21 Day Fix! Top with whatever toppings you prefer. 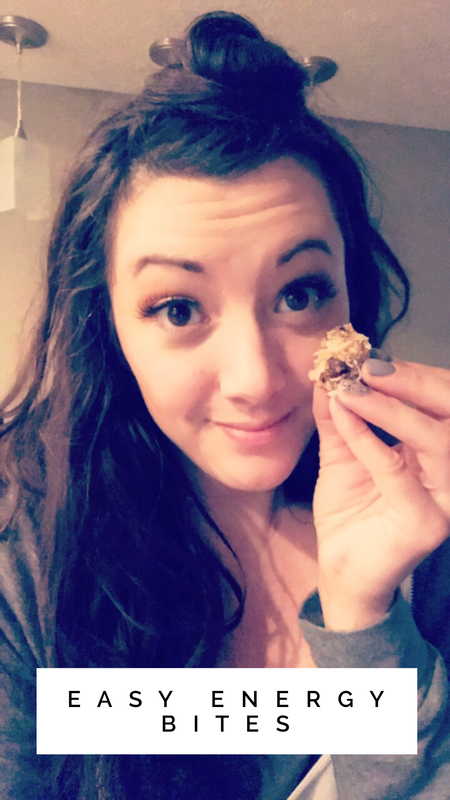 My staple toppings: Almonds, Cacao Nibs, Coconut Flakes, and Chia Seeds! Beautiful. My photography skills aren’t too shabby either. And if it helps….here is a quick video I made while whipping up some Nice Cream for breakfast the other day. Yes, I eat it for breakfast sometimes, and I am not ashamed. Today I think I am going to try out a pumpkin ice cream recipe….if it turns out, I will share, don’t worry!